In the pantheon of SOE’s (now Daybreak) flagship EverQuest franchise, there used to be a whole family of MMOs gathered around the table every evening. There was Papa EverQuest, looking a little wrinkled and worn but also radiating fame and authority. Next to him was Mama EverQuest II, a powerful matron of entertainment. And EverQuest Next used to be a twinkle in their eyes before it was extinguished. Then, in the next room over was a cabinet. The cabinet was locked. Inside that cabinet used to be a weird abnormality that certainly looks like a member of the family, but one that hadn’t seen the light of day in quite some time. This member subsisted on the scraps of an aging console and the fading loyalty of fans, hoping against odds that one day he’d be allowed out for a stroll or something. His name was EverQuest Online Adventures, the EverQuest MMO nobody mentions. EQOA was a strange abnormality in SOE’s lineup. While it was one of the very first console MMOs and heir to the EverQuest name, it was quickly eclipsed in both areas by other games and left alone. Yet, against all odds, it continued to operate on the PlayStation 2 for the better part of a decade before its lights were turned off. Today, let’s look at this interesting experiment and the small cult following it created. Deciding which game was the first console MMO is a debate I’m honestly not interested in dredging up today. Most folks would point to the 2000-2001 Phantasy Star Online on the Dreamcast, if your definition of MMO extends that far. Final Fantasy XI came out in Japan in 2002 but waited two years to make the transition to the States, during which EverQuest Online Adventures beat it to the punch in the west. So does it get a “first” medal? You decide. In any case, these were the first three titles that became the daring pioneers of console MMOs, to various ends. Consoles initially proved to be very resistant to MMOs due to the difficulty of payment options, limited (and fixed) hardware, the issue of communication, and the general impression that MMORPGs were just something that niche PC gamers played. Yet in the early 2000s, the EverQuest franchise was hot, with hundreds of thousands of players exploring Norrath on a daily basis. SOE, which had taken a leap of faith to make EverQuest in the first place, cast its eye on the popular PlayStation 2 console as a possible candidate to expand the franchise. However, it would prove to be much more difficult than launching a title on the PC. The biggest challenge for the team is that, Dreamcast aside, most late 1990s and early 2000s weren’t designed for online connections and play. The PlayStation 2, while technically capable of doing this, wasn’t as plug-and-play as the consoles we enjoy today. Gamers who wanted to get into EverQuest Online Adventures back then had a virtual obstacle course of purchases and actions to overcome. Not only did interested gamers have to own a PS2, a copy of EQOA, and an 8 MB memory card, but they had to find and install a network adapter, which in 2003 wasn’t easy to come by for everyone. If they wanted to talk with their fellow players with anything more complicated than the simple in-game chat macro system, a PS2 USB keyboard was also a must. These obstacles helped to condemn the title to a limited audience, which by all reports never topped 50,000 subscribers. While a PAL version of the game was released later in 2003, SOE would eventually pull support for it and shut down European servers in 2006, further narrowing the game’s playerbase. I’ve always noticed that SOE was practically allergic to calling any of its MMOs “sequels.” EQII is supposedly in a parallel universe, PlanetSide 2 is just a “reimagining,” and so on. 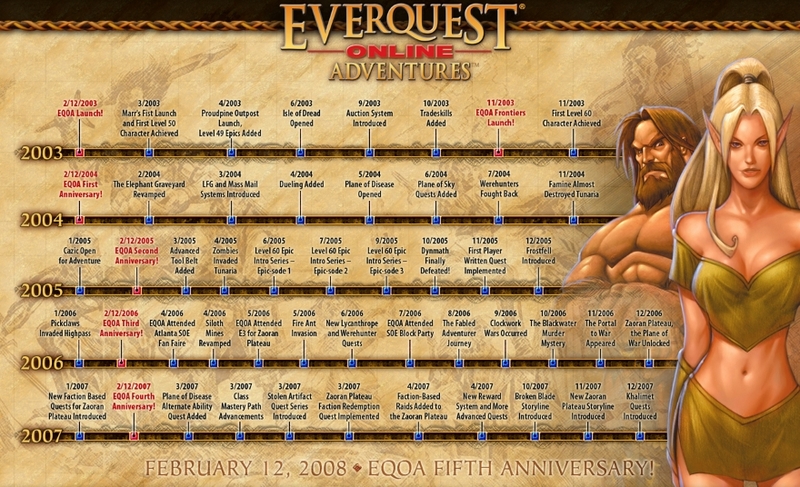 EQOA avoided sequel status by being set 500 years before the events of EverQuest. This prequel takes place in Norrath’s “Age of Adventure,” right about the time when the Elves started splitting into factions. Due to the limitations of the console platform, EQOA was created to be a somewhat more casual experience than its big brother on the PC. Of course, “casual” in 2003 could be seen as quite unforgiving today, but still, it was certainly a step toward a nicer, friendlier MMO environment. “The core design philosophy behind it was to get in and out and have fun in it in under 20 minutes or less,” developer Rod Humble said in 2003. The combat was certainly faster and even allowed for more positional strategy than in EQ. The game was a streamlined MMO experience: Players went out, fought, looted, and leveled up. There were quests of a sort, like turning your character into a werewolf, but nothing like what we’re used to today. Most of players’ game sessions were spent grinding mobs solo or with a group. Players could choose among 10 races and 15 classes when making a new character, although classes pairings were restricted by race. From there, they were sent into a seamless world consisting of the single continent of Tunaria to make their fortune or die trying. In fact, EQOA is notable for lessening EQ’s then-horrific death penalty somewhat by merely taking some money away from players and adding XP debt for each demise. EQOA’s sole expansion, Frontiers, debuted later in 2003. Unlike developing MMO expansions for the PC, expanding — or even patching — content on the PS2 was incredibly difficult due to the lack of an internal hard drive. I mean, 8 MB is all well and good if you want to throw a couple of MP3s on it, but a full expansion? Have fun with that! So a completely separate DVD was required to access the new expansion content and areas. Yes, it was an MMO where you had to swap discs during play. Frontiers beefed the game up considerably, adding an additional race, class, and several quests, increasing the level cap from 50 to 60, and adding new areas to explore. Starting with Frontiers, players could further customize their characters with Class Masteries. Garner enough CMs, and you could go and purchase yourself a cool new ability or even a master class version of your standard class. Unfortunately, Frontiers would be the only attempt to expand the game. There was word of a second expansion, but SOE ultimately decided not to go that route. “A lot of the team that would have worked on that has moved on to other products,” Clint Worley noted. Instead, the team kept putting out updates on a semi-regular basis. Despite not having an expansion release since 2003, EQOA’s continued to survive for most of a decade. Worley reported in 2007 that the game’s churn — the turnover between incoming and outgoing players — was very small, as it had achieved a stable subscriber base. Any sort of return or revival of the game seems doubly unlikely, considering the hardware and rights issues, although that hasn’t stopped one fan from doing his best to make it happen. No matter what, memories and records remain of this title. Want to relive more about this interesting game? Check out our look at the music from EQOA and its final moments as a live game! This was my 2nd MMORPG played, only predated by Runescape. I remember having the beefiest PS2 around with a keyboard, memory card, network adapter, then eventually the HD for FFXI. Surprisingly I never had any issues finding any of the equipment needed. I remember being impressed as hell with this, at the time. Though, like the article said, it did take a while to find the network add-on for my fat PS2. I really hope Daybreak does something (preferably successful) to update the EQ franchise and bring it to a new audience. The franchise really does have an insane amount of great lore and a feeling playing any of them that I’d really like to see continue into the future. Just a correction with the expansion Frontiers you never had to swap the disk during play. When you bought the expansion you had to use to new disc and that’s all never had to use the old disc for old or new content. I was always glad that console players were able to get a decent taste of EQ and I wonder how many are playing PC MMORPGS as a result? I still can’t understand why SOE and then DBG never produced a proper follow-up to EQ and EQ2 – note that I’m talking about EQ3 not EQN. An original style EQ/EQ2 MMORPG with current generation graphics would be hugely successful, and ESO has shown that it’s possible to make such a game cross-platform too. I suppose they just got distracted by the direction that Smed wanted to take MMOs in and so we ended up with a half-baked voxel game that was never going anywhere instead of what should have been a true successor to the EQ titles. SOE were the genre leaders that brought me into MMOs and it’s just sad to see the depths to which they have fallen even with their existing titles, let alone the failed opportunity to stay at the top of their game with new releases. Man–I remember when this released way back in the day. I never sailed the EverQuest brand, I regret it really, just because I was so into Ultima Online at the time. However, EverQuest was everywhere at my school at the time. I remember people that I didn’t even think were gamers trying EQ and becoming obsessed with it. I wish I would have tried it in its glory days; it’s tough going back to old MMO’s these days just because they don’t age that well. However, I do understand that EQ is the reason why MMO’s became so successful, even before WoW opened the doors even further. EQ used to be so Metal. Loved EQOA. It was so much fun and I didn’t find the hoops to getting to play it to be too difficult. I had several friends who played it too and we all had a blast. Ah, EQOA. I have fond memories of it. I played all three phases of the beta, still have all my beta discs, and even better/worse, I have the beta manuals. Another player made a Word doc, and I asked if I could make some tweaks. By the end of beta, it was a full color PDF document with tips, charts, and maps. We left about 6 months after Frontiers came out, and went to other MMOs, but I’ll always have a soft spot for EQOA. My wife and I played EQOA with 1-2 other friends for something like 4 years of it’s time. I still have my beta disk, as does 1 of the 2 friends I mentioned. It was a relaxing way to spend some time and my wife got rather OCD (I me, CDO, really. :) ) and was exploring and cataloging and all that all over the place. One of those friends even figured out how to extract the map data from the original game disks and print them out, if only sort as like satellite images of the ‘planet’. We were highly active for the first couple of years, and then mostly as ‘got nothing else to do’ filler for the other two that we played. After that CoH stole us away. I still have very fond memories of EQOA and the community around it. When it was shut down I wasn’t surprised, but I was sad. This was my 1st MMORPG on PS2 and took about a year and a half of my life.